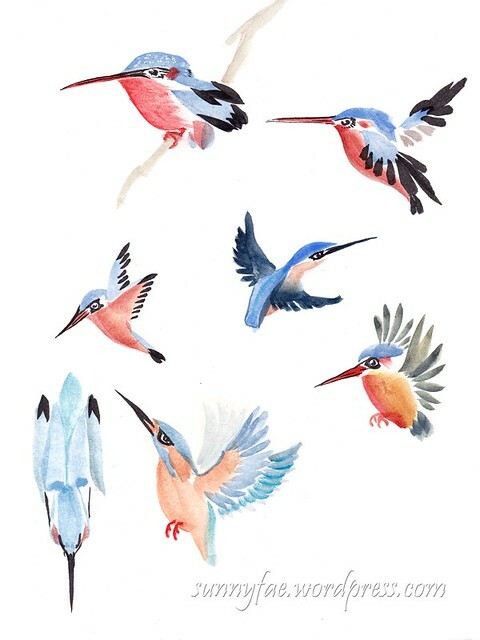 I’m still having lots of fun painting birds, last week I painted lots of kingfisher’s, something I thoroughly enjoyed doing. On my travels during the week I spotted a tutorial in a watercolour painting book by a lady called Lucy Wang. She was showing how to paint humming birds (almost kingfisher’s right?) they were beautifully simplified so as soon as I returned home I decided to try out painting a few of my own. The top image is me painting in her style from her tutorial, for this page I used a water brush because I was in a rush to try them out. Back to kingfishers and trying to paint them in this style, some worked better than others again painted with a water brush. (The first one is very humming-bird shaped). Now I have birds on the brain! I tried a few more humming birds using a #8 round sable brush. In my sketchbook they are about the size of my thumb. I used photos for some whilst the others were more inspired by photos using colours I like. The last set if birds are painted days later trying to remember how I painted the first humming birds, changing up the colours. 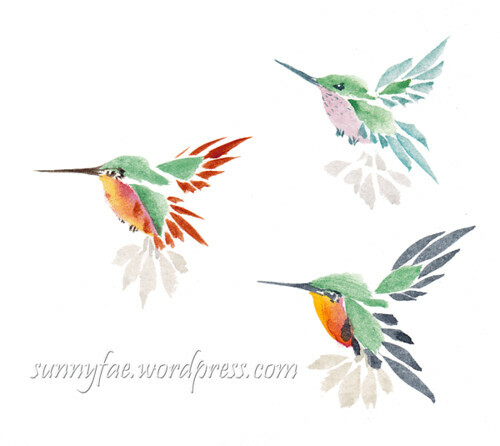 Three hummingbirds, changing up the colours. I didn’t buy the watercolour book because it was there were only two pages of interest. I do love her style of painting though and looked around the interwebs to find any book written by Lucy Wang but unfortunately they seem to be out of print. Maybe she’ll write another one! No matter, I’ll keep an eye out and maybe I will find a second-hand copy, fingers crossed. What sweet birds. It is hard to believe you did these with a water brush. Your brushwork is lovely, as usual. Thanks for sharing. 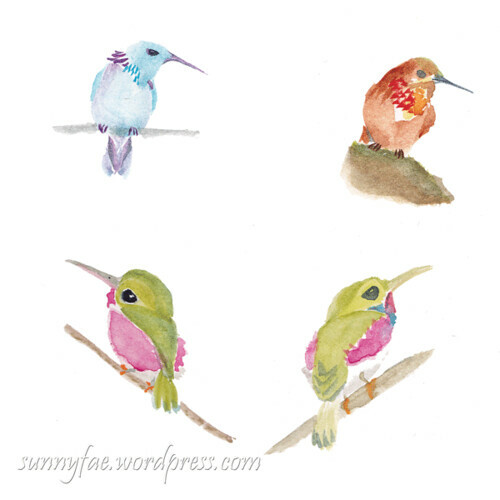 I love your hummingbirds… ! 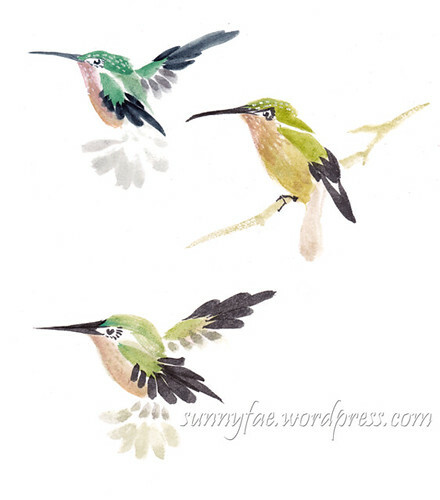 Interesting Hummingbirds, they are very stylized.